I wanted to start a more regular feature for the Sentinel Hill Press blog. After a bit of contemplation (sans any sort of ‘chapel’), I was inspired by a feature I’d like to eventually included in future episodes of the Sentinel Hill Press-cast discussing the stories from HPL that form the basis of what eventually becomes Lovecraft Country. 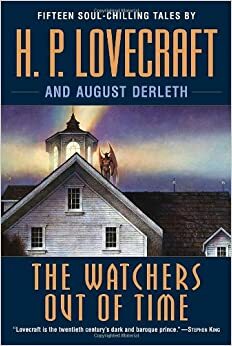 Instead of Lovecraft, for the blog I thought I would look at the Lovecraft Country stories of August Derleth. I’ve spoken about Derleth before on this blog – often at best in mixed terms – but I suspect his contributions of Lovecraft Country are probably second only to HPL himself (followed by Lin Carter, among a few others) and so I thought it might be useful as a means to more ably recognize what Keith Herber drew from Derleth, as a way to force myself to read more Derleth, and perhaps as a source of inspiration – consider the article on “Witches’ Hollow” from issue #3 of The Arkham Gazette. I thought I would start with those stories that Derleth claimed were “posthumous” collaborations with Lovecraft. To be clear, at best these works were story fragments from Lovecraft that Derleth greatly expanded upon. Far more often these stories were inspired by entries from Lovecraft’s Commonplace book and contain no text written by Lovecraft at all. For a concise introduction, see this discussion of these works on hplovecraft.com. For the moment I want to focus on those stories actually set in Lovecraft Country – Arkham mostly – rather than those where Arkham or Innsmouth or Miskatonic University is mentioned but does not play a significant role in the plot. A story that would very much work in any one of DC or EC horror comics (think Creepshow) from that era. Fred Hadley, a Boston delivery man, is caught in a downpour while making deliveries in the “all but abandoned country” north of Dunwich. He takes shelter on a farm owned by an aged rustic named Amos Stark – who speaks in that weird phonetic dialect made infamous by Zadok Allen. Stark reveals that the day is the fifth anniversary of Stark’s receipt of a a $5000 loan from his friend Nahum Wentworth, hence it is “Wenworth’s Day”. Tragically Wendworth has died several months previously, felled in a hunting “accident” when he was shot in the head by Allen. After some discussion of Stark’s disinterest in going to the ‘big city’ and some place setting revealing the Stark/Wentworth connection, talk turns to Stark’s personal library, which includes, ex libris from the late Mr. Wenworth, a copy of The Seventh Book of Moses, which he describes as “a curious rigmarole of chants and incantations”. Hadley, worn out from his travels, eventually retires to Stark’s couch, taking the Seventh Book of Moses with him. As one is apparently want to do while perusing a grimoire found in an ancient house in backwoods New England, he copies one of the incantations down, “nothing less than an incantation for the assemblage of devils or spirits, or the raising of the dead”. In a… what is a good antonym for shocking?… turn he also reads the incantations aloud several times “not for a moment expecting anything untoward to take place”. After a page or two describing the sounds our narrator hears as his host paces about the old house, muttering expository statements, there is a knock at the door. As it is now past midnight… or so Stark thinks, wrongly as his clock is 10 minutes fast… he answers the door. Cutting to the chase, it is the withered corpse of Nahum Wentworth, which proceeds to throttle Stark. Hadley bursts into the room and discovers Stark “on his back, and sitting astride him was a mouldering skeleton, its bony arms bowed above his throat, fingers at his neck”. At this point, in pure Lovecraftian fashion, or narrator faints. When he awakens Hadley hurries to find Stark dead where he’d last seen him, with a few stray fingerbones from Wenworth just pulling free from the dead man’s neck, and bouncing off into the night… all in italics! There is little to go on here. Derleth’s Dunwich has its own bank, somehow, and someone well-to-do enough to make an unsecured personal loan of $5000. The farmhouse in question is said to be 17 miles north of Dunwich, which would put it in New Hampshire – someplace being in the middle of nowhere and 17 miles from the nearest town does not work for any place in Massachusetts really. There is mention of a state highway running through “the valley” which I presume to be the Miskatonic Valley, which contradicts “The Dunwich Horror” as well, as the story make s the point that the village is well-off the Aylesbury Pike (or any major road). I wonder if the mentions of Dunwich and Arkham (and setting the story in 1927), which constitute the sole explicit nods to Lovecraft Country were added by Derleth to justify claiming it was from Lovecraft? This story only barely qualifies as Lovecraft Country, as explained above, and is very much not in the vein of Lovecraft’s later cosmic horror – maybe the closest to this sort of revenge from the grave tale might be his “In the Vault“. This is a, dare I say, “oogie-boogie” story of little import. It is interesting to see Derleth using a real magical work – The Sixth and Seventh Books of Moses are genuine 19th century magical works claiming to be ancient mystic texts. Derleth directly quotes the Magical Law of Moses (Aila himel adonaij…) which according to the 1880 copy of the book that link directs you to are “terrible” words which “assemble devils or spirits, or… will cause the dead to appear”. Considering this works connections to 19th century German-American magical community and Derleth’s mention that this particular region was known for “Hexerei”, which is Pennsylvania-German for ‘witchcraft’, this story might have bade more sense sent in that state rather than in greater Dunwich. Chris Jarocha-Ernst, in a post on Yog-sothoth.com that I shall be referring to often, suggests this story was inspired by entry #8 from Lovecraft’s Commonplace book and I agree with him. For a second take, Chris and Chad from the H.P. Lovecraft Literary podcast discussed this story back in August of 2015… sadly it is available to their subscribers only. Next time… “The Gable Window”! Wentworth’s Day, in fact the Survivor and Other Tales as a whole, was my introduction to Lovecraftian horror. Say what you want about Derleth, but I reckon that his writing is more in the style of Call of Cthulhu than anything Lovecraft wrote (barring Beyond the Mountains of Madness). I very much agree that there is definitely an often unrecognized (and possibly unrealized) influence of Derleth on Call of Cthulhu, from Derleth’s impact on how Lovecraft’s stories were packaged to how they were perceived by readers (influenced by the Derleth-Lovecraft collaborations which were popularly thought to be more HPL’s own work than they actually wer)e. If nothing else, consider that some scenario are described as Lovecraftian, highlighting how the core game veers from HPL’s usual vision. While I definitely don’t love most of Derleth’s Mythos fiction, I have offered some qualified praise of it (see our first October-ganza entry for Rhoda Prentiss).